Six rhythmic pieces for piano: Tiempo Feliz—Bella Vita—Carmelita—Tango Rondino—Estrellita—Fiesta. Performed by Scot Hawkins at the January 25, 2015 concert of the Composers Society of Montgomery County, Maryland. Six pieces for the developing pianist: Garden Stroll—Roses—Morning Glory—Larkspur—The Swallow—Little Brook. Performed by Hon-Cheong Chan at the October 30, 2016 concert of the Composers Society of Montgomery County, Maryland. Five piano pieces evoking the countryside: Meadow Walk—The Skylark—The Storm—Dance of the Woodland Spirits—Harvest Jig. Performed by Scot Hawkins at the April 24, 2016 concert of the Composers Society of Montgomery County, Maryland. Feelings portrayed in five piano pieces: Day Dreaming—Grieving—Delight—Dark Thoughts—Playfulness. Performed by Scot Hawkins at the October 29, 2017 concert of the Composers Society of Montgomery County, Maryland. Five romantic pieces for piano: First Glance—Romance—Lost Love—Return to Me—Memories of You. 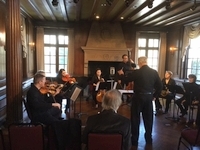 Performed by Scot Hawkins at the April 26, 2015 concert of the Composers Society of Montgomery County, Maryland. Five piano pieces in the bluesy mood: Freddie’s Rag—Magenta Evening—Cookie Walk—Lazy Day—Granny Boogie. Performed by Hon-Cheong Chan at the April 29, 2018 concert of the Composers Society of Montgomery County, Maryland. A musical reading of the biblical story of Adam and Eve. The best of Robert Hanrott & Mick Wayne. Incidental music for Alan Bennet's “Talking Heads” Studio Theatre, 1996. Chris Forbes on piano. 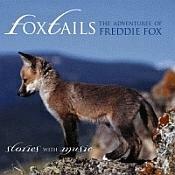 Children's audio CD of stories with music. Set in the English countryside, Freddie's adventures, told in rhymed verse, can be enjoyed on several levels. For adults and children 6 and up. Glossary included.